Since plastic bags take anywhere between 500 and 1000 years to biodegrade, what on earth can we do to place less plastic in our world? One way my family has decided to cut back significantly on our plastic bag waste is to use alternatives to plastic sandwich bags. Up until last year, we were purchasing about one small sandwich size box and one gallon size box of bags a month for all sorts of uses, but mostly for school lunches and for freezing purposes. Are there really other ways to do these without plastic bags? Yes there are! At first, I thought my children might hate being different than all their friends as they gathered at the lunch tables at school using containers other than plastic bags, but actually, they really liked a couple of the other choices I gave them. In fact, they were the ones who encouraged me to write this initiative. There are several options available to cut out the use of plastic lunch bags. 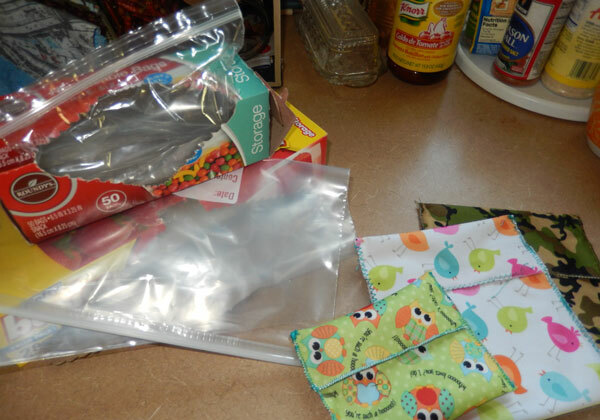 Alternatives include waxed paper bags, reusable & washable cloth snack bags, and glass and plastic containers which you may already have around the house. Waxed paper bags are a great biodegradable alternative! The disadvantage: they do not seal; however, they are great for sandwiches and work well for sliced apples and various other snacks. My oldest son really has been faithful to use these bags. The best part of these is that you can throw them out knowing they won’t be around for hundreds of years after their one use. 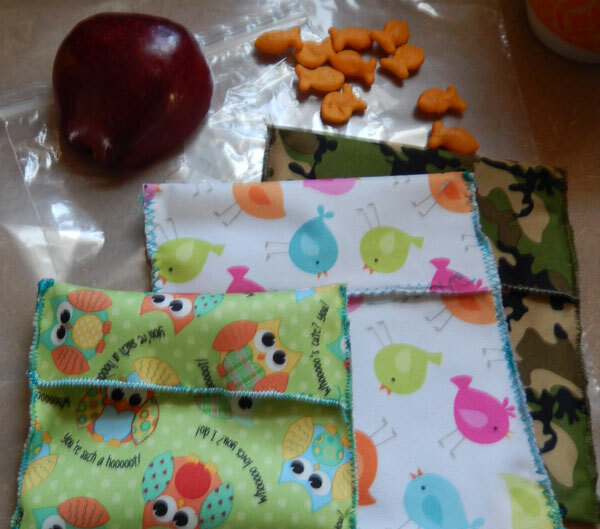 Cloth snack bags are a great alternative, and my children have loved using them because they have cool patterns and are just fun. The disadvantages are that they require the work of washing, and are not disposable if you are on the go. It also depends on the responsibility of your children; we had several cloth snack bags get lost in the black hole of my daughter’s room only to return to us moldy and unusable. 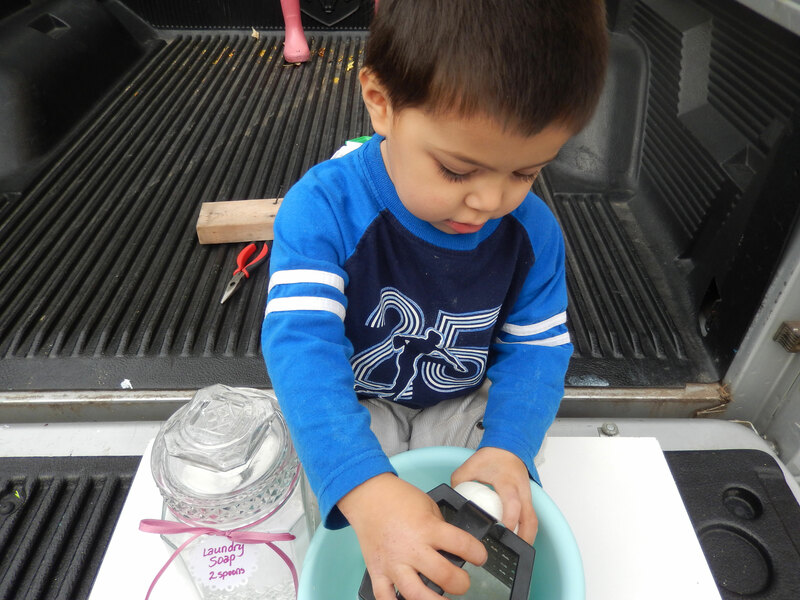 It was not a problem for my son…only you can tell if this will work for your household. There are quite a few different styles available, and can be purchased at places like Target or at online stores like Etsy shops, or can be made by hand if you like to sew (which is what we did). Glass, plastic, and steel container options also are great. 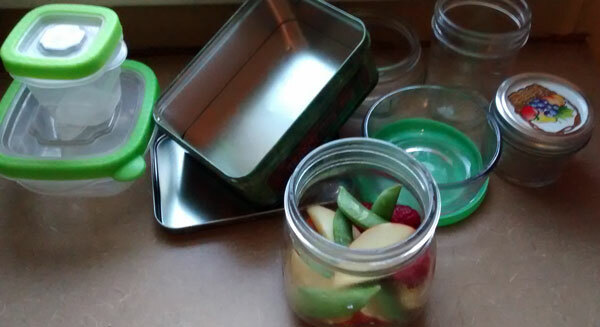 I have several small and medium jelly jars which I use to bring carrots, seeds and other snacks with us when my 3 year old needs food, and these work well, as do the small plastic containers. The advantages of these are that they are easy to clean and do not leak. The disadvantage is they can break, though for us this has not been a problem. Obviously, plastic containers are still plastic; however, if you already have them in your house, you are not contributing anything more to the environmental waste than you already would be, so you might as well use them! There are also some nice stainless steel lunch containers on the market. We have not invested in these, but my sister uses them for her children’s lunches and she has liked them a lot. They are a bit pricey, but cleaning is very easy and they are quite durable. Eliminating disposable plastic lunch bags is a great way to make a significant impact on this earth that we live on. It is fairly easy, once you take the step, and our family has been successfully doing lunches this way for a year now. Won’t you join us on our journey to an earthier-minded home? Tags: alternatives, cloth sandwich bags, cloth snack bags, eco-freindly, jelly jars, plastic, plastic bags, resuable bags, sandwich bags, snack bags, waxed paper bags | Permalink. What is your favorite laundry soap? Do you use liquid soap? Powder? 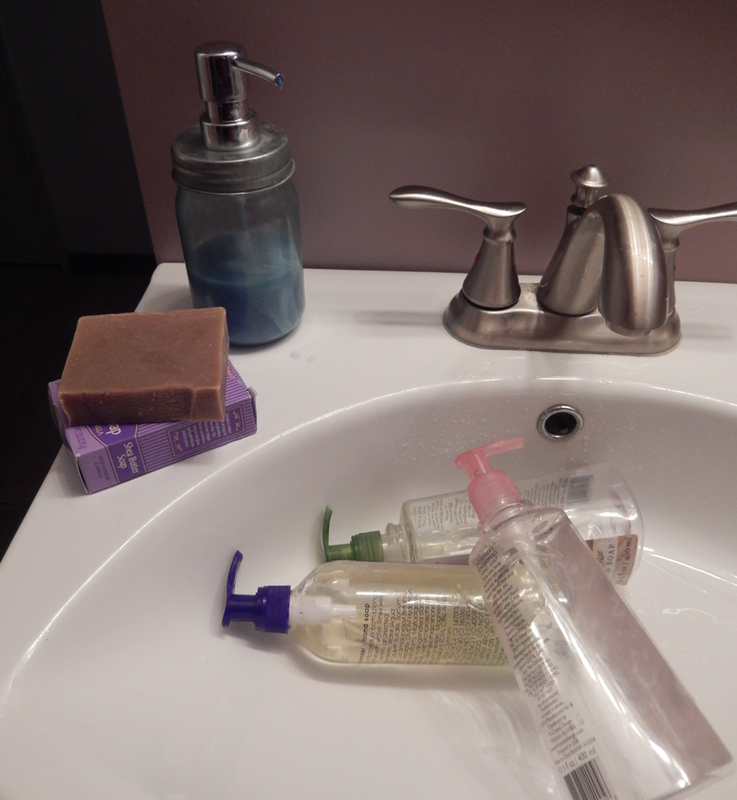 If you are in a family similar to mine, you go through a lot of soap in a short time. I had been spending from $7.00 to $10.00 a month on liquid laundry soap, which for us was a significant amount of our shopping budget. On top of that, my guilt always kicked in at the end of using up our liquid soap and I had a big old chunk of plastic to throw into the recycling bin. But there are some economical, earth friendly options—DIY laundry detergent and soap nuts are two good options to consider. 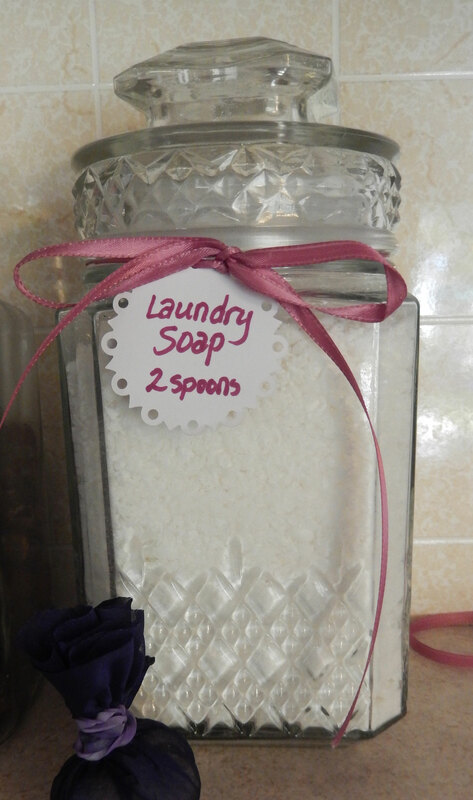 As I looked into the alternatives, I found some “recipes” for making your own laundry soap. I was a little skeptical at first; however, I have been making my own laundry soap for almost a year now and don’t plan on reverting to my old ways. Now, if you are not into using up your valuable time to make your own laundry detergent, simply purchasing powdered laundry soap packaged in a cardboard box will be sufficient to make a significant environmental impact. However, making your own detergent can reduce waste even more, and has a couple other advantages as well. You can find recipes for either liquid or powdered detergent online, but most require 3 basic ingredients…Borax Detergent Booster, Super Washing Soda, and a bar of soap (Many sites will recommend a specific brand of soap, but a great variety will do the trick. I have begun to purchase mine at our local dollar store). 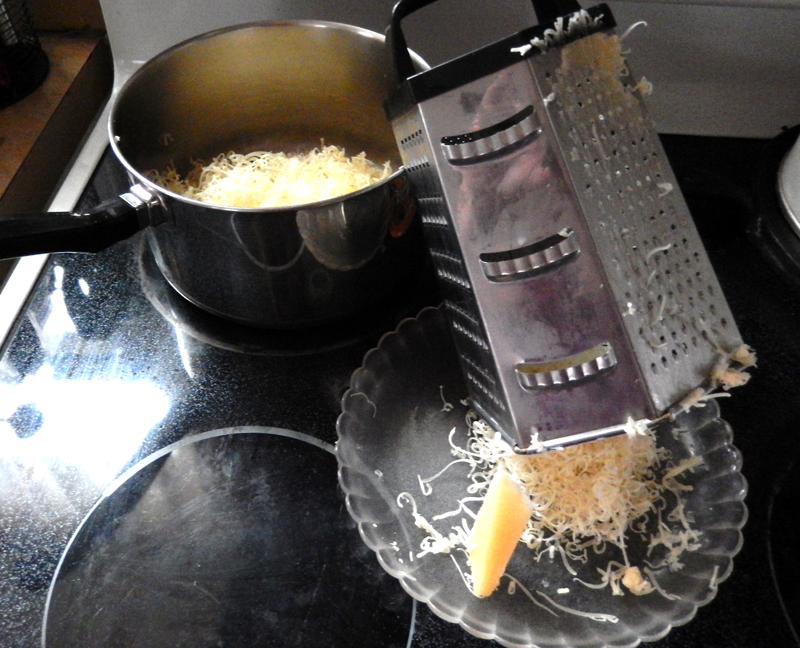 For powdered detergent, just mix the ingredients together and grate your soap with a cheese grater. For liquid soap, you will need to do the same but add the ingredients to hot water to dissolve. This is a general overview, so you will need to do a little research to find the specifics on making your own detergent. 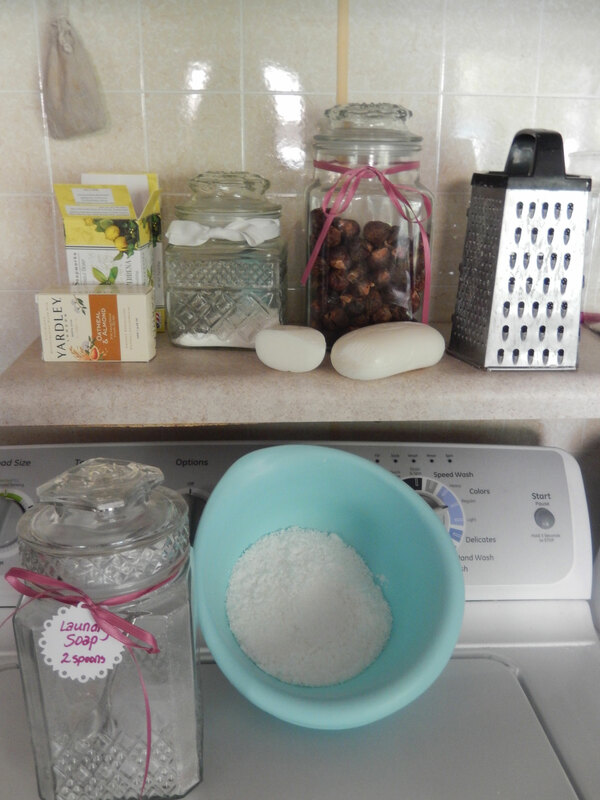 I chose powder over liquid because I do not have to keep around bulky detergent bottles, use plastic in any way and there are less prep steps involved when making and using powdered detergent. The ingredients are all packaged in paper or cardboard, and therefore are biodegradable, and I now spend less than $2.00 a month on laundry soap. I have found that the mundane task of grating soap is a perfect thing while watching TV or while I am sitting outside making sure my 3 year old is playing safely. Sometimes he even helps me! One warning: if you have sensitive skin, this may not be a good option for you. My son has extremely sensitive skin, and the Super Washing Soda was too much for his skin to take. I make a different batch that leaves out the washing soda and that works well for him and the laundry. My sister introduced me to soap nuts. These are actual nuts that have a soap-like substance in them that is safe for the environment, and are supposed to be hypoallergenic as well. I love the concept and they are very affordable. They are also packaged in an earth-conscious manner. I have used these off and on, but as of yet, they have not become a permanent part of my laundry regimen. They require using warm water to activate the soapiness, and despite their hypoallergenic label, my son still breaks out in a rash when I use this on his clothes. So, if you are looking for changing something small in your life to make a greater impact on the well-being of our earth, consider making a change in your laundry detergent. This is one initiative I have stayed with, and am very glad to have made the change. Both my earth-conscious and my pocketbook thank me for the change. Won’t you join me? Tags: bar soap, clothing, detergent, earth friendly, eco-friendly, ecology, laundry, laundry detergent, soap, soap nuts | Permalink. I have heretofore written about initiatives I have begun and have had success with incorporating into our household. I will tell you now, however, the plastic shampoo bottle is still an unconquerable mountain for me. I would like to eliminate purchasing shampoo that is packaged in plastic but I have had no success in alternatives! The shampoo bar is the most commonly hailed alternative that I have seen. I tried out several types of these on myself first before introducing such a foreign concept to my family, however I had no luck. 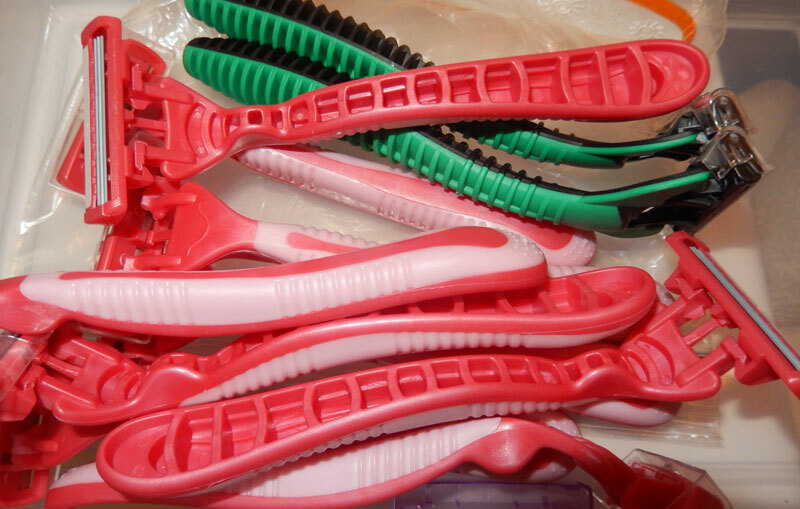 These only made my hair look greasier each time I used it (even though it was not actually greasier). When I wrote to one of the vendors of the bar shampoo, they said give it some time and also to do a vinegar rinse to clean out my hair first. I did all this without it changing that bar shampoo either does not work, does not work in my hair or does not work with my water. Whatever the case, I can in no way recommend this to my family, much less to you. I have looked for alternatives packaged in glass, but in some ways this is no better of an alternative, and I am having trouble finding this as well. Are there local shampoo makers that sell shampoo to you in your own containers? I wish I could find them! If you have any eco-friendly shampoo alternatives, please let me know. This is one area I have not found success in. I have read that some people give up using shampoo altogether for the sake of the environment, and that one’s hair naturally balances its oil after a while. They still do a vinegar rinse every now and then, but that is that. Well I might be brave enough to try this eventually, but I would rather my kids and husband not have to answer questions like “Did your wife give up bathing altogether or something?” Maybe I need to just go out on a couple week camping trip which is always a good excuse for bad hair. I would invite you to join me on this journey…but I have no direction on this one. Do you? Please send in responses with your alternatives. Tags: bar shampoo, bar soap, eco-freindly, hair washing, plastic shampoo bottle, shampoo, vinegar hair rinse | Permalink. The plastic used for liquid soaps is one of my greatest miseries. I have gone through them about one every three weeks, each time adding more waste to the world. How can we avoid it? Is there really any other way? Well, yes, there is. It is funny that it never came into my head that one could use bar soap to wash one’s hands. It has fairly gone out of fashion in the United States. However, it is clearly the way to produce the least waste to wash one’s hands since bar soap can be purchased wrapped only in a small sheet of paper. Of course, one cannot be an extreme germophobe to travel this route. 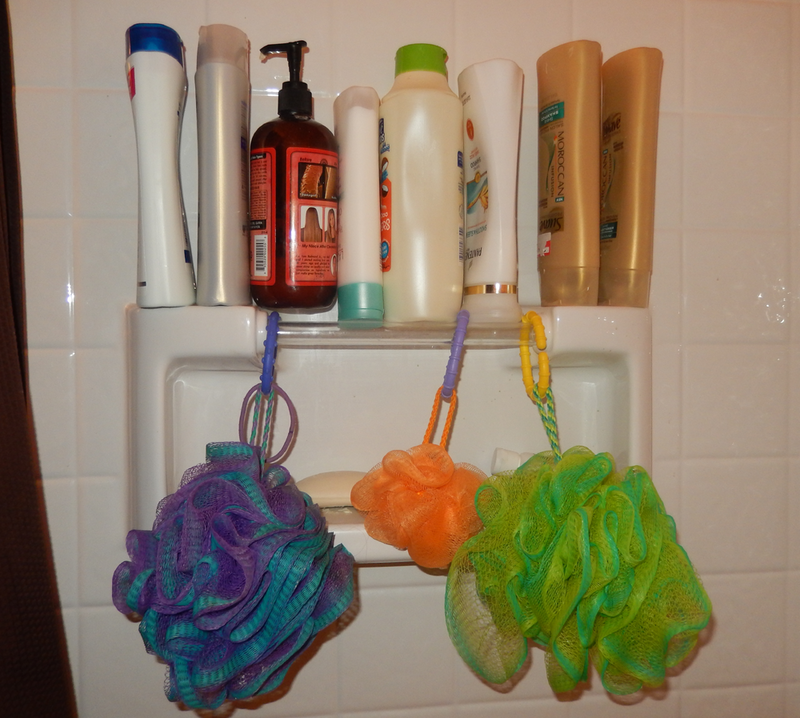 If the dirt and germ leftovers visible in the soap are too yucky for you, there is still another way! Since I have been traveling this journey of reduction of our household waste, I have begun making liquid hand soap from bar soap. 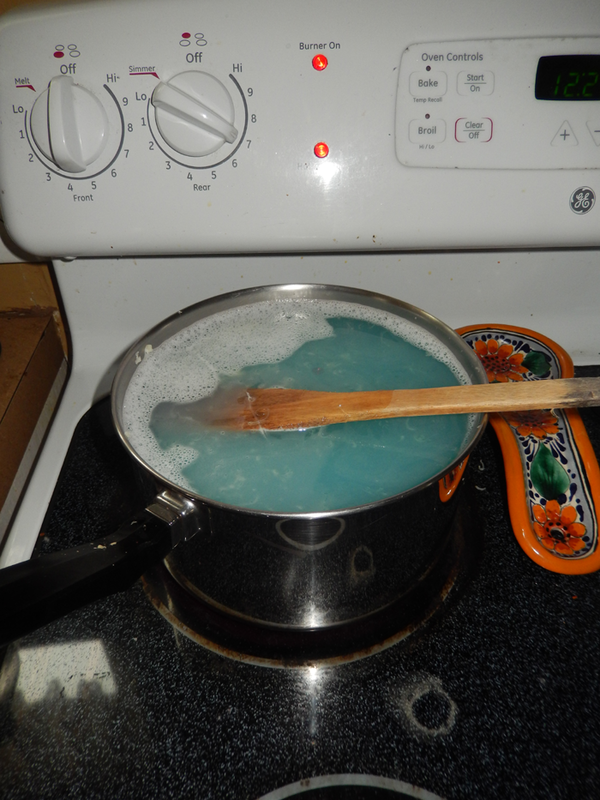 I have simply grated the bar soap and mixed with distilled water, warming in a pot to thoroughly dissolve the soap. If you are a bit artistic, you may like the fact you can drop food dye into it to color it to match the room in which the soap will be residing. As a note, this thickens over a couple of days, so it will not be as liquid as in the beginning. You may use old plastic soap pumps, or find some fancier pumps for sale, but over all, you will either save money or come out about even in making your own soap, and in taking the time to make it yourself, you will have the satisfaction of cutting out a large source of plastic waste from your household! This is one eco-friendly lifestyle-step I am excited to be making. Will you join our earthier-minded home in this? Tags: bar soap, eco-friendly, hand soap alternatives, handsoap, plastic, pump soap, soap | Permalink. 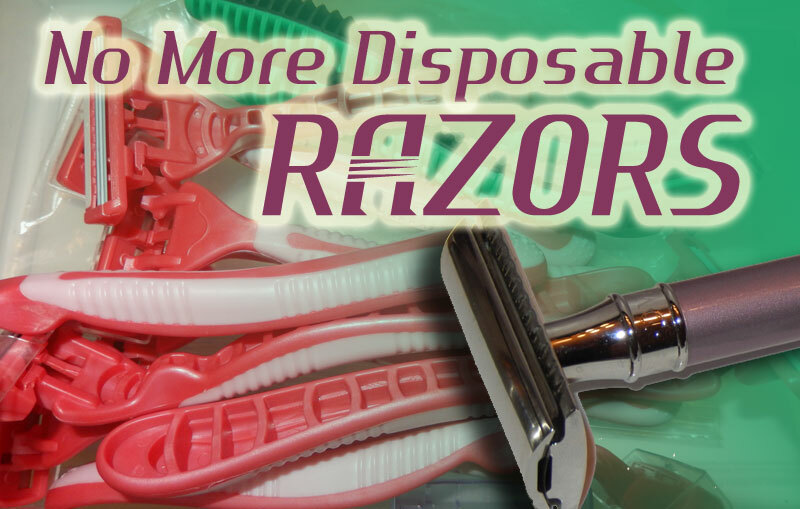 Disposable razors—plastic and stainless steel, useful for 1 week to 1 month, and then—to the trash bin. This is one of the items that I have really disliked purchasing because of all of the plastic wasted. One can purchase the plastic razors with disposable heads and this does cut down on the plastic waste, but the head replacements are a bit pricey. 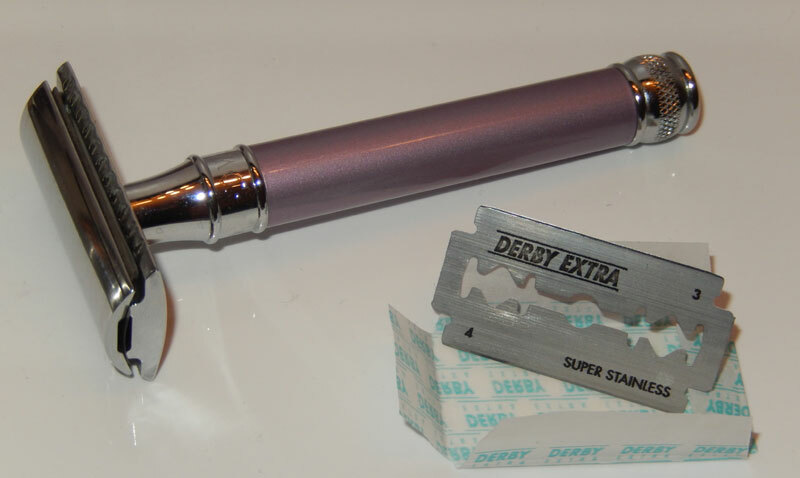 I began to look into the alternatives when I began the Journey to an Earthier Minded Home about three months ago, and I found that there was such a thing as a double-edge safety razor made of stainless steel—perfectly plastic-less—and made to last a long time. I looked at these stainless steel safety razors for quite a while, because they range from about $25 to $40. That is quite a bit more than what I spend on myself as a rule for any one thing, but I placed it on my wish list for Christmas, and I received one! I have waited to write about it just to give it a good trial period to see if I really liked it or not, and I really do like it. It has a much closer shave, and the only part that needs replacement is the thin, stainless steel razor blade which lasts a long time. This is not a completely plastic-free solution, however, as the razor blades come in a small plastic box. I will have to look into the availability of packaging that is plastic-free for these blades, and if you know of where these can be purchased without the plastic box, please let me know. As for now, I am still using the same razor blade the razor came with, and I expect to get quite a few more shaves out of it. Even with the plastic box to hold the blades, much less plastic is being used and wasted and the replacement for the blades is far less of an expense than purchasing the equivalent number of disposable razors on the cheapest end of the spectrum. You will definitely save money over time by purchasing a metal safety razor…but it will likely be a good while before you receive your savings. The environmental impact of switching to a stainless steel safety razor is definitely worth the investment. When my husband finally uses up all of the disposable razors I had purchased for us, I will be getting him a stainless steel safety razor as well. Will you join my family on our journey to an Earthier Minded Home? Tags: disposable razor, double edged razor blades, environmentally conscious, plastic-free, plastic-less, razor, safety razors, stainless steel razor, stainless steel razor blades | Permalink. Whatever holiday you are celebrating, gift-giving time is a perfect opportunity to be earthier-minded! 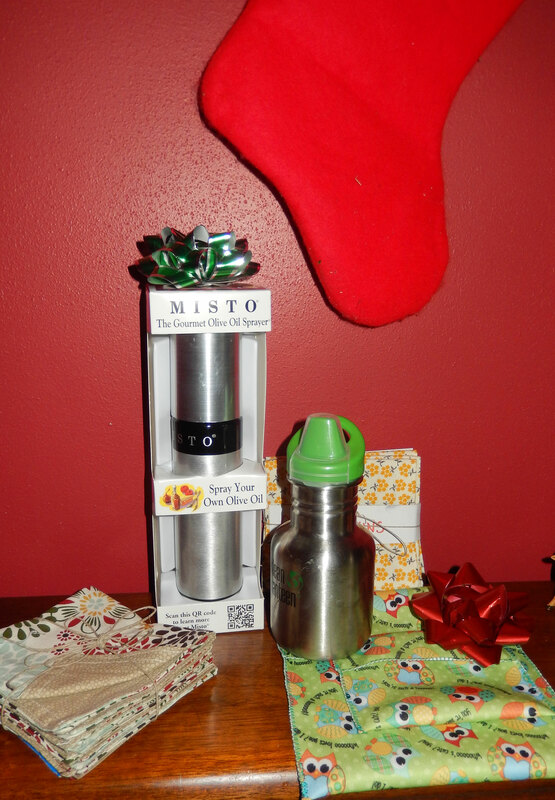 Whether it is the gifts you are giving, or what makes it on your wish-list, it is an opportunity to make eco-friendly choices that will impact the future. I have several items I have wished for this year, which I have just not been able to justify buying. Like a metal razor with replaceable blades…so earthier minded but so much more expensive that what I can justify buying myself. Or a refillable cooking oil spray bottle. Or stainless steel food storage containers for leftovers when you go out to eat. Or a glass sport water bottle. If you have been holding off on some earthier-minded changes in your life…this might be just the time to make them! On to gift-giving. As I was thinking of gifts I wanted to give people this year, many of them were items I have added to my life on my so-far-short-but-sweet journey to an earthier-minded home just because I liked them so much myself. 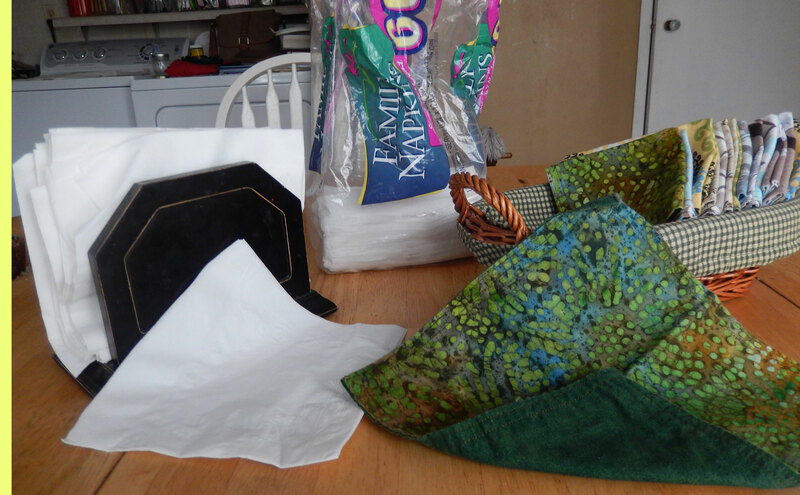 I have been sitting at my sewing machine making cloth napkins to match my family’s kitchens. I also am purchasing other items that are eco-friendly as well. For my two year old, I have purchased a quality stainless steel no-spill water bottle. Other earth-friendly are being given out too, but for secrecy sake, I cannot share them at this time. J The great thing about earth friendly gift-giving is that you can have an impact on the earth through the lives of your friends and family, too, whether that is their goal or not. In doing so, it is possible you may end up winning another person over to starting their own journey toward living an earthier-minded life, or at least toward thinking about it. My family will be celebrating Christmas in an earthier-minded way this year, though gift-giving is not the true meaning of the holiday. Whatever holiday you may be celebrating, we hope you have a blessed time with family and friends, and keep in mind you can celebrate it in an earthier-minded way! If you have ideas that are eco-friendly ways of celebrating the holiday season, please share them! Tags: Christmas, eco-friendly, gift-giving, gifts, holiday, holiday season | Permalink. 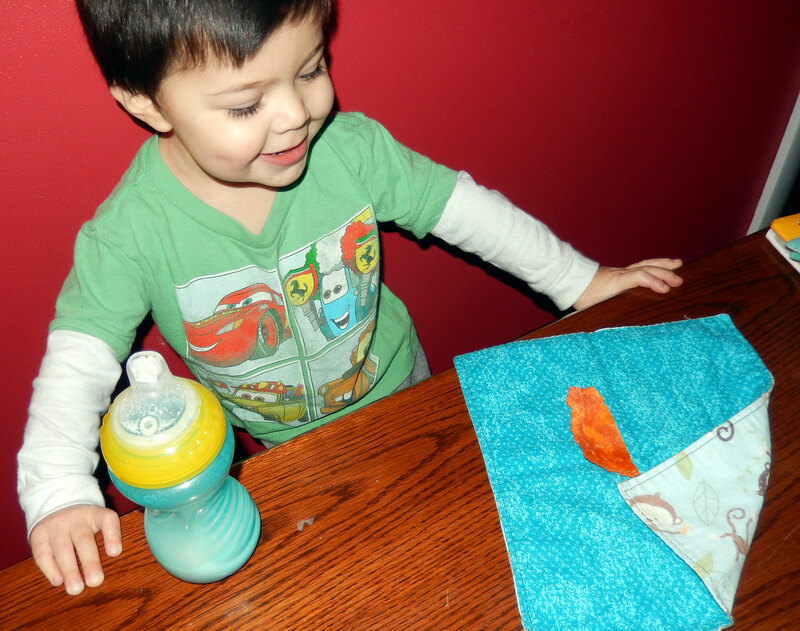 Cloth napkins… who knew that it would make dinner time just a little more fun? The goal in the beginning was to eliminate or reduce the waste of paper napkins. Up until recently, our household would go through a large package of paper napkins a month. I tried to purchase napkins from recycled paper, but the plastic wrapping that they were packaged in always bothered me. It is funny how the thought of fabric napkins never crossed my mind as an alternative until I began this journey a couple of months ago to our earthier minded home. Being an artistic sort and wanting to be able to pick the fabric myself, I chose to make my own napkins. There are plenty of places to purchase cloth napkins if sitting at the sewing machine doesn’t excite you. If you like fun, there are fun ones. As usual, you can find a great selection of fabric napkins from sellers on Etsy. Since I have kids, boring, uni-colored napkins will not do. 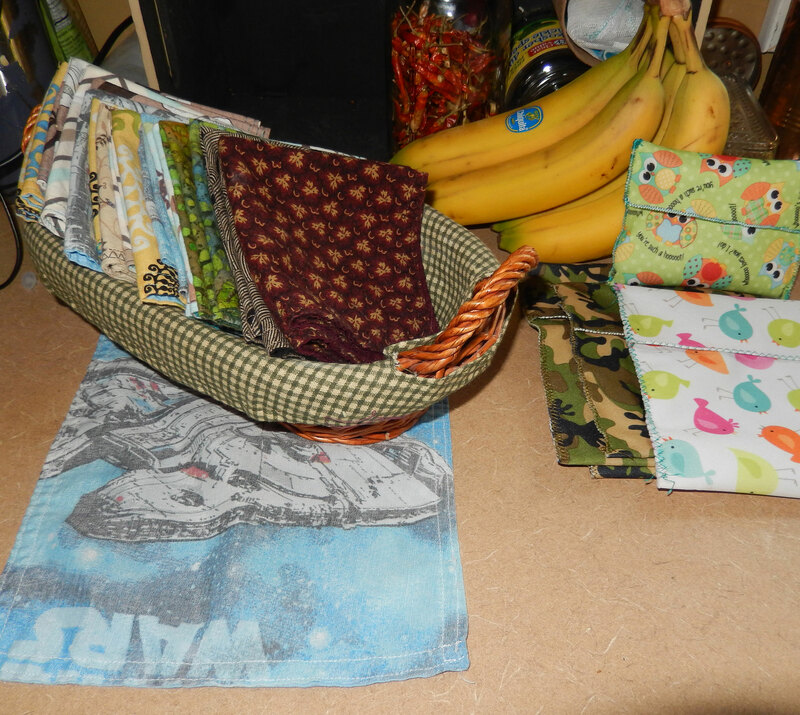 I set out to make an assortment of fun fabric napkins to suit each person in our family—from Frozen to Star Wars themed, and some colorful patterned ones as well. I was expecting my family to miss their paper napkins, but to my surprise, they really liked the fabric ones. It has given another element to enjoy about dinner time, and my daughter especially likes to pick out napkins for each of us since she is really observant at knowing each of our likes and dislikes. If you sew, you can make these at a very low cost. 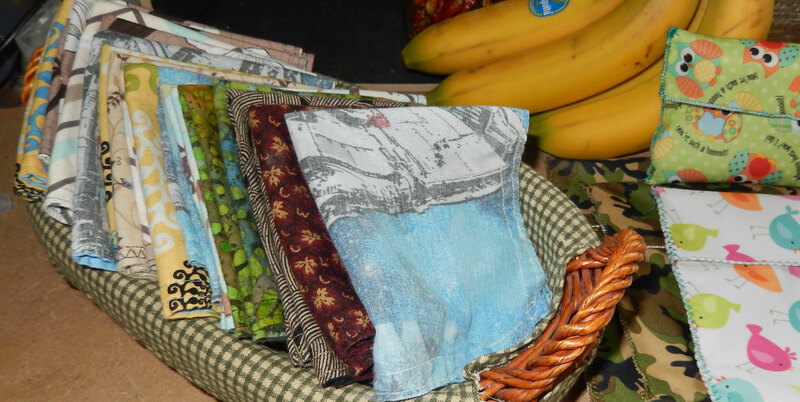 I purchased fabric remnants at half the typical price and found some great fabrics, but you can re-purpose old material if you want to keep it simple and greatly lessen the environmental impact of your cloth napkins. My son’s Star Wars napkins were made from a bed sheet of his that finally ripped enough times I could not repair it. He was happy to be able to keep his favorite sheets in one form or another. If you are trying to keep your impact on the earth low, this is a simple way to lessen it a little. No trees had to be injured. You still need to launder your cloth napkins–which does take another toll on the environment–however, we simply throw them in with the rest of our laundry, and it doesn’t change the load size we select on the washer dial. We have happily made this step to use cloth napkins in our earthier-minded home. Will you join us? Tags: cloth napkins, earth minded, eco-friendly, napkins, paper, paper napkins, plastic bags, trees, waste | Permalink.